“The Gateway to the Sahara,” Ouarzazate is a calm and modern Moroccan town on the edge of the desert. 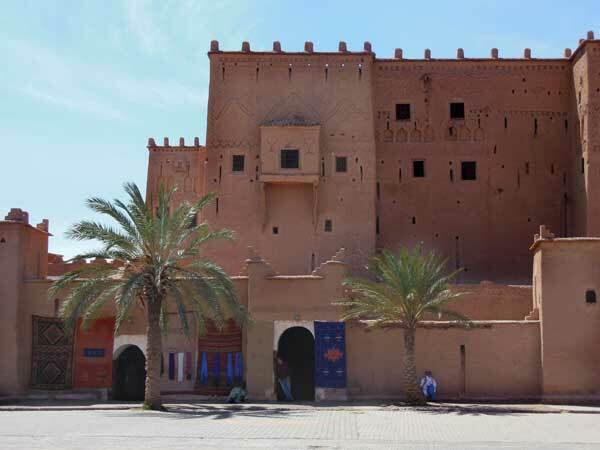 Once an outpost of Berber traders coming up from the Sahara, it became an important French garrison town during the colonial period, and now is transformed into a starting point for tourists headed south. At Agdz we turned off the road and onto a “piste,” the French word for the kind of dirt road that we would call a “trail.” The terrain varies from sharp rocky patches, to packed sand, to round rocky bits, to soft sand, each requiring a different “safe” speed. Most of the big desert crossing will take place on such “pistes,” along well-traveled routes of criss-crossing tracks in the sand. Knowing how to “read” the tracks, so we can follow them to a distant visual waypoint, will be a crucial skill for the trans-Sahara expedition. Patissier and Delli-Zotti are teaching me to interpret the tracks and develop a rhythm for driving long distances across the landscape while paying careful attention to terrain obstacles that could pose a danger to the vehicle. It is harder than it seems because it requires constant vigilance as I scan the horizon for topographical “clues” that will help me identify potential hazards. “Green” is an important warning. 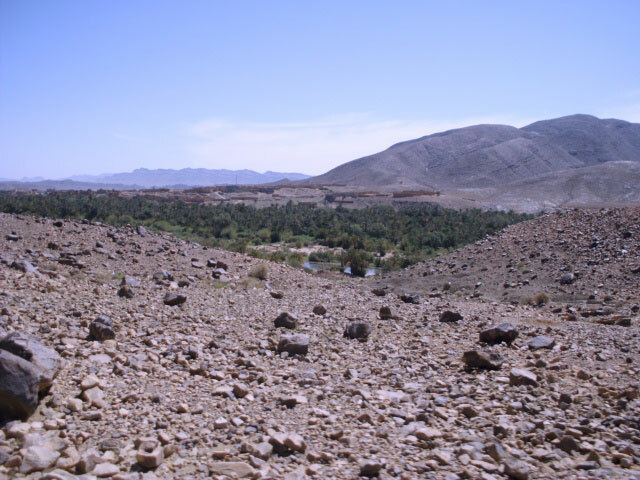 Green trees or plants indicate a wadi or other place where water accumulates. I must reduce speed on approach, as the terrain is often problematic here, complicated by soft sand, loose rocks deposited by flowing water, and the plants themselves. 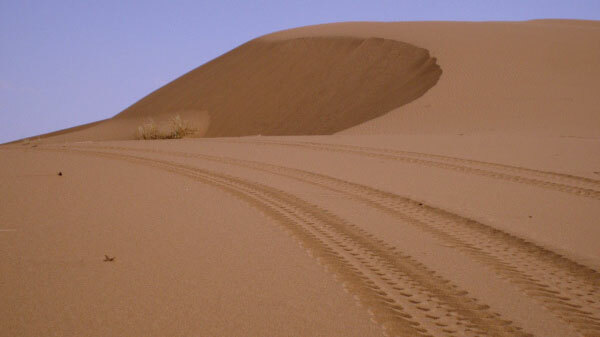 The “sequence” goes like this: slow down before the approach, which usually includes a slight dip, once down in the wadi, adjust speed to an appropriate level, according to whether it is soft sand (fast) or loose rocks (slow), then get enough momentum to exit the slope upwards, easing up on the throttle as you come to the top onto relatively level ground where you can go back to “cruise” speed. At Tinfou, I encountered my first sand dunes. Starting with the smaller ones we began a progression to get across to the other side. Patissier and Delli-Zotti coached me through. Their years of experience racing the Dakar (dating from when it was still the Paris-Dakar) have given them an unparalleled expertise on crossing dunes, and they shared that knowledge with me as I attempted to navigate towards an imaginary checkpoint near a distant tree. I was pleasantly surprised by the fact that it wasn’t technically that “difficult” once I understood the sequence. What makes it complicated is knowing where you are going. Driving the dunes requires quick thinking and fast action — we must decide our next move while still in motion. We look for clues — rippled sand, camel droppings, previous tracks — that indicate a “good” line. Sometimes the dunes are just too steep or tall to try to cross, so we must find a better place to traverse, somewhere less steep or lower. And the spaces between the dunes can be equally treacherous, with deep holes, soft crumbling sand, and bushes of “camel grass” (a tenacious plant with spiky branches that can stop a truck in its tracks). We need to avoid all but the smallest patches of camel grass. I learned this lesson when I turned too late and snagged the edge of a bush half buried in the sand. The plant was hopelessly tangled in the underside of the vehicle. In addition to having to dig, we needed to pull the sharp branches out all around the wheel. A machete would come in very handy. After playing in the dunes for a while, I was beginning to understand that there is a way to navigate through to the other side without losing your overall sense of direction. I felt like I was uncovering the mystery of this marvelous landscape as we set off for the desert outpost of M’hamid, the last village before the massive sea of dunes known as Erg Cheggaga. 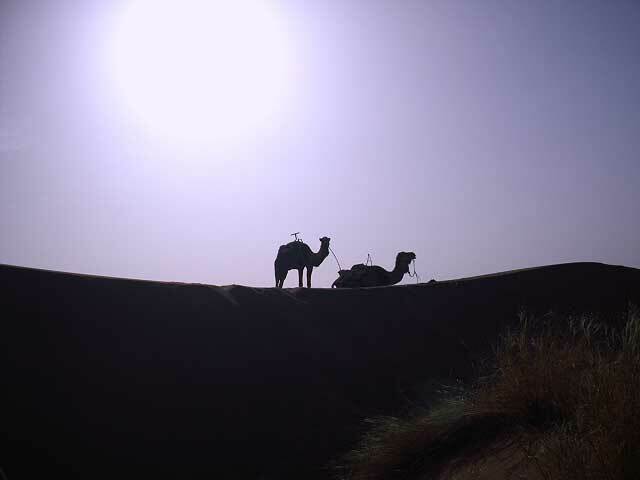 The camels on the horizon seemed eternal, a promise that the Sahara still has more secrets to reveal. The wind had picked up overnight and the world looked different through the filter of sand. A strange diffuse light permeated the earth, softening the colors, and erasing the shadows that defined the edges of the waves of sand. Visibility was so low we could not see the mountain range that should be on our right. The unexpected navigational challenge of “instrument conditions” made it harder to find a visual point of reference in line with our heading. 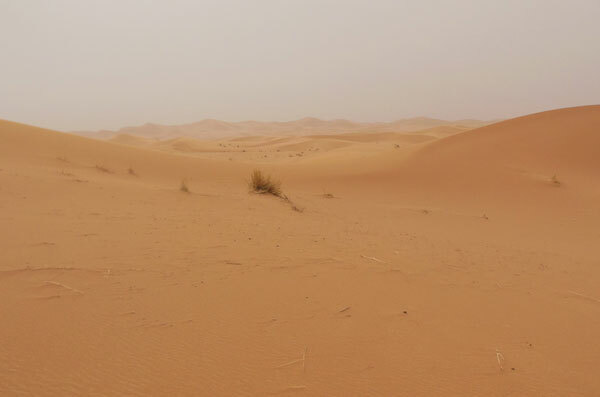 Nevermind that the desert is bascially flat, and barren, and has very few significant land formations, now we could not even see any of the distant terrain features that should define our overall direction — we would have to move incrementally towards what we could see. Picking out a tree that we could make out thru the sand haze, we drove “off-piste” directly toward it. 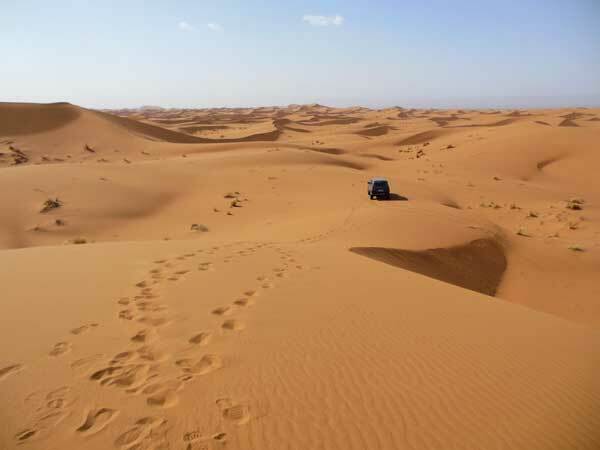 As the desert spread out before us, criss-crossing tracks from hundreds of 4x4s carrying tourists traced an enormous “piste” that wasn’t a single path, but rather the cumulative set of many paths generally going in the same direction — to the dunes. It seemed to be the only destination. Following the tracks was easy and it wasn’t. The confused mess of ruts in the sand are a deceiving “crutch” — if we follow them blindly we might not end up where we want to be. A set of tracks seems to go in the direction we want but then diverts off to the other side of a tree, and then again a slight divergence and before we know it we are far off our heading. Having visual waypoints is crucial, as is knowing the spatial relationship between far- and near- waypoints. The sand gets softer and control of the vehicle gets more difficult. There are “langues de sable,” soft sand that has blown onto the piste in a mini dune-like form — seemingly innocuous piles of sand that can “toss” a vehicle sideways if hit too fast. Even more treacherous are compact areas of small dunes with lots of greenery in the middle. There is no “safe” place to stop, and no space to maneuver for momentum. Trees and camel grass are everywhere, forcing you to zig-zag and circle around to avoid entanglement until you are completely disoriented. Patissier advises me to detour around this kind of terrain even if it adds some extra “distance” to my track during the Gazelle competition. And Delli-Zotti points out that the added “distance” is negligible, considering the zigging and zagging we would do inside the “messy spot” —- not to mention the time we would lose getting repeatedly stuck and unstuck. He suggests we follow a straight line along the edge of the area, and offset around it. Beyond lies the dried cracked mud of the oued, with tufts of green peeking out — dangerous because it can just “sink” under the vehicle in a trap of deep mud. It is imperative to remain on existing tracks here. We reached the massive sea of dunes known as “Cheggaga” and the immensity of it all became clear. The challenge would be to keep moving through this sandbox while maintaining a sense of direction. It seemed impossible. Driving straight up the sand wall I could see nothing but sky. At the top there was only time for a slight pause to determine which direction to take. 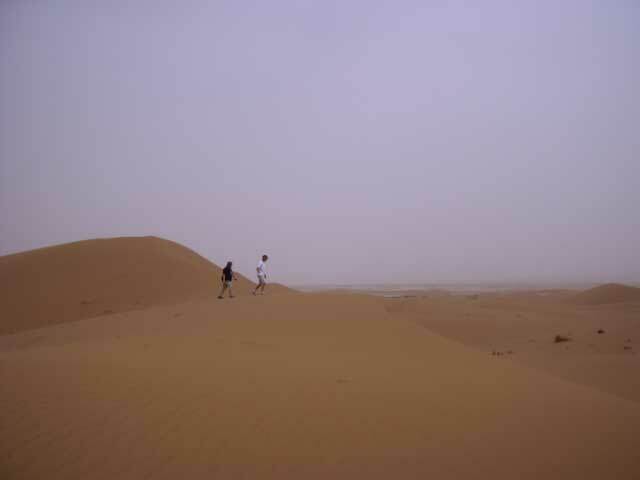 Patissier and Delli-Zotti were at home in this terrain, and Delli-Zotti took on the role of my navigator, calling out direction for me to take at the top of each dune. “All” I needed to do was drive it. As I became more familiar with the “process” of driving across the fragile piles of sand, I realized how critical orientation was. It was so easy to lose track of “north” as we moved from hill to hill. A successful crossing of Cheggaga without GPS would be difficult. There are no clear points of reference for navigation, and the dunes themselves look different from different angles, so it is next to impossible to pick one out as a waypoint and keep track of it as you zig and zag. Knowing the structure of this “sea” helps a little. 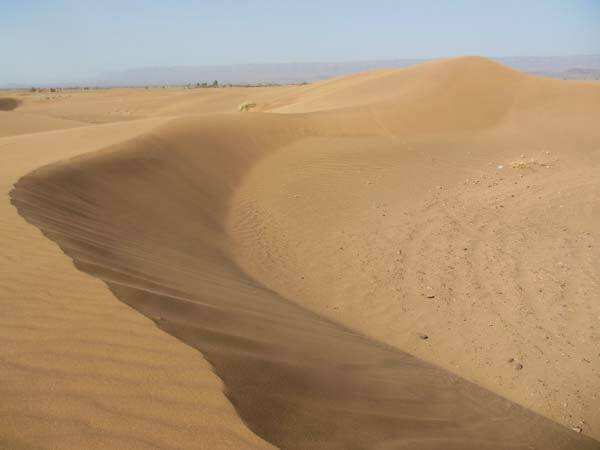 Cheggaga has a specific orientation with “corridors” in between the three “ranges” of dunes. Knowing which direction we need to travel would help us develop a strategy. If we have to travel the length, we could do much of it using the “corridors.” If we have to traverse the width, we must “cross” the dunes. Delli-Zotti took me up to the top of one of the larger dunes to get a real overview. From up there we could see into the distance, and identify the mountain range to our right, which we could use as a key “landmark” to keep ourselves headed in the overall correct sense. Those mountains should always be to our right (for the direction we were traveling), and we should always be able to see them from the higher dunes — unless visibility is as bad as it had been earlier. The “impossible” was becoming “possible.” There is a rhythm to these waves of sand. And that rhythm is the key that unlocks the mystery to driving the dunes. We can appreciate the immensity of this hauntingly harsh beauty atop the crest. We are alone here looking across eternity. This is the magic of the Sahara. As we journey across the grand Erg we feel its majesty. A perfect blue sky offsets the sand, and the early sun imbues the earth with a warm glow. Climbing up the side of a dune we ride the crest its full length before gently turning along its curve. Momentum carries us to the top of the next one and then a slow soft descent. Poetry in motion. We work our way to an imaginary destination in the middle of nowhere. It all comes together here amid the shifting perspectives of wind-blown sand. I feel ready. Isabelle Patissier and Thierry Delli-Zotti continue to compete actively in the Dakar rally, and via their Ecole de Pilotage they maintain a regular training schedule for rally racers in Morocco and the south of France. Ouarzazate, in the Souss-Massa-Drâa of southern-central Morocco is at an elevation of 1,160 metres (3,810 ft) in the middle of a bare plateau south of the High Atlas Mountains. To the south of the town is the desert. The area is mainly inhabited by Berbers and is a noted film-making location.